One of the most effective natural psoriasis treatments is a psoriasis diet treatment plan. I can confirm this as I currently control my psoriasis just from making simple changes to my lifestyle. However this post is not for me to explain how I control my psoriasis through diet but to group together all of the positive comments, testimonials and success stories that I have found online regarding the benefits of a psoriasis friendly diet. 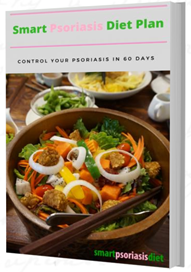 Before I move on, if you have not already read my free ebook that explains exactly how I figured out what was causing my psoriasis flare up’s and how I successfully got it under control through the use of diet and supplements please check it out below. Will Diet Alone Cure Your Psoriasis? Unfortunately all of us psoriasis sufferers were dealt the genetic make up that allowed us to develop this condition. Therefore we will never be able to fully cure this condition once activated, but you can learn how to control it. 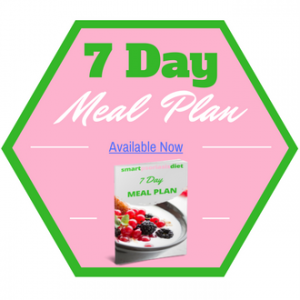 Diet alone will help immensely in doing so, but you must also think about altering your lifestyle to give you the best chance possible of never having to worry about this condition again. A lot of people have tried and failed using a psoriasis diet treatment plan. The reason is that you need to look at how peoples lives have changed in the past 30 years. We are eating less wholesome food which means we are deficient in many vitamins, minerals and nutrients that previous generations took for granted. Because the food we eat now does not contain all the nutrients we need, you must ensure that you are taking the correct vitamins and supplements that work together while at the same time eating the right foods to give your body the best chance to heal your psoriasis naturally. It took me a while to perfect the correct healing foods to eat and also the correct supplements to take to complement my diet. This helped to not only stop my psoriasis from spreading but actually heal my skin from the inside out. Therefore my quick advice to anyone who wants to control their psoriasis quickly is to put into effect at least the top 7 treatments in the top 20 natural psoriasis treatment list – the most important action being your diet. To reinforce how important diet is to your psoriasis, here are some other success stories from people around the world who use diet to control their psoriasis condition. This is a fantastic success story that gives me great pleasure to share. It is quite long but also included are before and after pictures. It is definitely worth your while to read this for inspiration. Here are before and after pictures of the aforementioned Tommy’s psoriasis. Look at what some discipline and motivation can do to improve your psoriasis. The second success story confirms that gluten and dairy are the main food types you must cut from your diet to begin healing your psoriasis. Just by eliminating wheat alone you will automatically eat healthier foods which quicken the healing time. I found a fantastic thread where a poster has seen massive improvement by following a diet of vegetable juicing, no sugar, gluten or alcohol (as best he can) along with some supplements to complement the healthy diet. This is another common psoriasis diet success story and very much focuses on the anti-inflammatory foods. Here is more verification that wheat is a common cause of psoriasis flare-ups and for some lucky psoriasis sufferers, just eliminating wheat alone will cure your psoriasis. Here we see a recommendation for using an alkaline diet to get rid of psoriasis. An alkaline diet is very similar to an anti-inflammatory diet and also the John Pagano diet. Here are 5 more fantastic testimonials about diet controlling psoriasis. As you can see here, not everyone who cuts out gluten sees an improvement, however, she has seen an improvement by keeping an alkaline heavy diet. And again diet shown to eliminate psoriasis. Are the success stories starting to get familiar yet? I like this post as it details one of the most common problems that you will encounter with when trying to change to a healthier diet – social nights out. The one thing to note about using diet to heal your psoriasis, is the more strict you become, the faster it will disappear. But a lot of people are happy to be less strict with their diet and see slower progress if they have milder forms of psoriasis that does not impact their daily lives in a serious way. Some people are more anxious about the appearance of their skin then others so you and only you can decide how quickly you really want your psoriasis to improve. Once you realize this, you can prioritize your life accordingly. Here is a very reasoned and intelligent post. This is further evidence that diet affects psoriasis in a positive way. 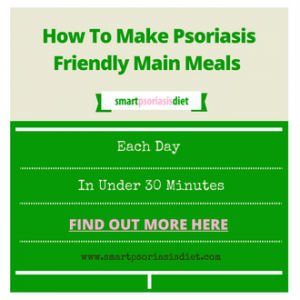 I like to include this forum post as it explains how it may take longer for some people to clear their psoriasis naturally with diet. From the brief post, she doesn’t describe the exact changes she has made to her diet but I am sure she could quicken up the healing process if she added certain supplements to her diet and got some more exposure to the sun (even better if it was while doing some outdoor exercise). Eating well reduces her flare ups so she still is very upbeat about it even if it is taking a bit longer than normal in my opinion. Probably the quickest way to clear psoriasis is going “raw”. Now it is a little extreme, and you definitely need to get advice from your doctor before you begin such a regime. However here are two unsurprising success story I found which support going raw and juice fasting. Here is a fantastic story taken from the daily mail newspaper in the UK – I have tried to find the TV show that this story is taken from on youtube but unfortunately can’t find it. I want to share a personal story about the John Pagano diet which I tried 10 years ago. He emphasizes eating a lot of fruit so I would eat 10 pieces of fruit a day as well as 5 varieties of vegetables. My psoriasis started to converge and drastically increase in size. Always do your due diligence and proper research when trying something new to help your psoriasis. The diet I now adhere to takes all this into account and while I have some fruit every day, I definitely eat way more vegetables than fruit and my skin has been the great benefactor of that choice. Here is one of the few negative stories I have found about using diet as a “cure” for psoriasis. Maybe the person misunderstood the Pagano diet like I had done? If you have spent some time going through my top 20 best and most effective treatments for treating psoriasis naturally, you will notice how the effectiveness score varies drastically from No.20 up to the top 7 treatments. It may not come as much of a surprise that Diet is my number 1 choice of controlling your psoriasis. So without further ado, I give Diet an effectiveness score of 9/10 for treating psoriasis. 3 weeks – aggressiveness and redness starts to subside. The lesions will start to flatten out, bigger spots will divide up into small spots and will start to heal from the inside out. 6 weeks – only stubborn old spots will remain. Patches which have disappeared will show a slightly different pale pink color to your previously unaffected skin but this will rectify itself over time. 8 weeks – Improvement rate will slow down at this stage and stubborn patches will have improved slightly. If you continue to keep a strict diet which includes plenty of green shakes and juicing, you will obviously heal faster. Your skin will be the best it has been in years at this stage, and you may feel inclined to fall back into old habits which you really should hope to avoid. One piece of advice would be to start exercising more as it gets better, that way you will start to feel awesome both physically and mentally and can probably burn off any treats you may decide to introduce back into your life at this stage. From a money point of view, it will probably work out cheaper using diet and supplements to clear your psoriasis as conventional medicine treatments are very expensive and very ineffective over time. Whereas changes to your diet will only work out at possibly a few dollars more per week to your grocery bill. Hopefully, the elimination of expensive “treats” like cigarettes, alcohol and sweets will offset any increase in buying more fresh fruit and vegetables. Time is the biggest factor in using diet to treat psoriasis, however when you start to see great results after just 3 weeks then it will seem like nothing in the long term. You will feel better, look better, be more social, the benefits are really endless when you get your psoriasis under control through diet and some simple lifestyle changes. You will feel better, look better, be more social, the benefits are really endless when you get your psoriasis under control through diet and some simple lifestyle changes. All the natural psoriasis treatments you need to know to find that right lifestyle balance are in my top 20 natural treatments list. 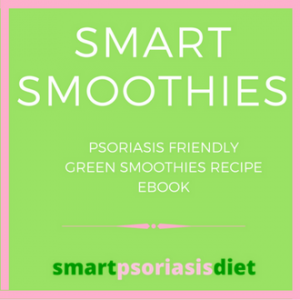 When you download my free ebook, it will explain exactly what I do to control my psoriasis and hopefully it will give you motivation and ideas to help you change your lifestyle for the better. If you want to live a stress-free happy life with little to no psoriasis then you need to TAKE ACTION now. I could have included 100 more success stories of how diet and healthy lifestyle changes can eliminate psoriasis forever. How can it be a fad or a gimmick when so many people have proven the connection between diet and psoriasis exist? For anyone else reading this article who has seen improvements to your psoriasis using diet, I would love to hear your success stories, so send me an email!